I forget how this book ended up in my library. Probably picked up while killing time at a train station or airport. That’s where I mostly seem to buy this kind of lightweight non-fiction. My brain is too tired for the imagination required of a novel or the attention required of more in-depth non-fiction. 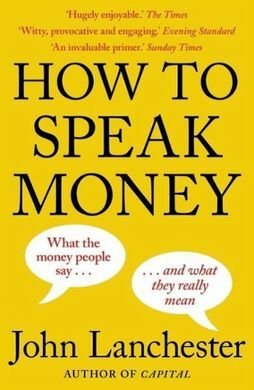 How to Speak Money by John Lanchester is a dictionary of terms used about money in the media and by the financial services industry. It’s a handy think to have because many of those terms are difficult to grasp and the meaning of them quite technical. Reading this book will give you a better understanding of what people mean by such things as inflation, equities and hedge funds, or downsizing and rent. There’s some historical context given in the entries about Keynes, Friedman and Marx, and a long introduction that describes what’s happened in economics and finance in the last century or so. What I found interesting was Lanchester’s focus on the amount of reversification used in the language used to talk about money. Reversification is a word coined by Lanchester for when a term is used to describe the opposite of their initial sense, often deliberately in order to obscure what’s really happening. An example is ‘credit’, which really means ‘debt’. We were brought up to believe debt was a bad thing and people don’t want more of it, but if you rename it credit it sounds like a good thing that you want more of. It’s bit dry. Lanchester’s writing is quite witty and snarky but there’s only so much he can do with the material. But it is informative and enlightening and well worth reading if you want to understand money and economics a bit more.